SEATTLE, Wash. – APiJET, the industry leader in real-time, on-board, automated data analytics, today announced the APiJET Proven Partner Program. Program partners work with APiJET to help airline customers operate more efficiently, leading to reduced operational costs. “Airlines have shown great interest in learning how we can help streamline their operations,” says Tom Gibbons, APiJET interim CEO. APiJET offers improved operational efficiency through its Smart Aircraft™ System. It supports smart flight and ground operations as well as line and heavy maintenance in real-time, anywhere in the world. Launch customer, Icelandair, has fully deployed APiJET’s analytics service across its entire fleet of Boeing aircraft. 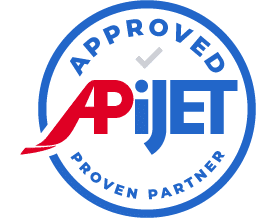 APiJET Proven Partners deliver onboard hardware, inflight connectivity, software applications and sensors that operate on aircraft. The program ensures that all their products and services work well together so airline customers can effectively deploy the APiJET Smart Aircraft system. There are four categories for APiJET’s Proven Partners: onboard hardware (Astronics Ballard Technology, The SA Group); software applications and sensors (IWS Inflight Warning Systems, PACE GmbH – a TXT company, VisionMonitor); connectivity (Global Eagle); and consultants and software vendors. Providers wishing to learn more about the program and how to participate are invited to visit http://apijet.com/proven-partner-program/. Members of APiJET’s leadership and software team will attend the Electronic Flight Bag Users Forum November 13-15 in London. Visit them at Stand 29. APiJET is sponsoring the Thursday Afternoon Break at the forum. To learn more, visit: https://apijet.com/.